GIS optimizes tourism management and ensures effective interaction between the government and third parties. GIS for Tourist Attractions manages all spatial and descriptive information. A web GIS application promotes the tourist sites in a new and attractive way. Some of the most fascinating tourist attractions in Bulgaria are managed and popularized by the first-of-its-kind GIS in the country. 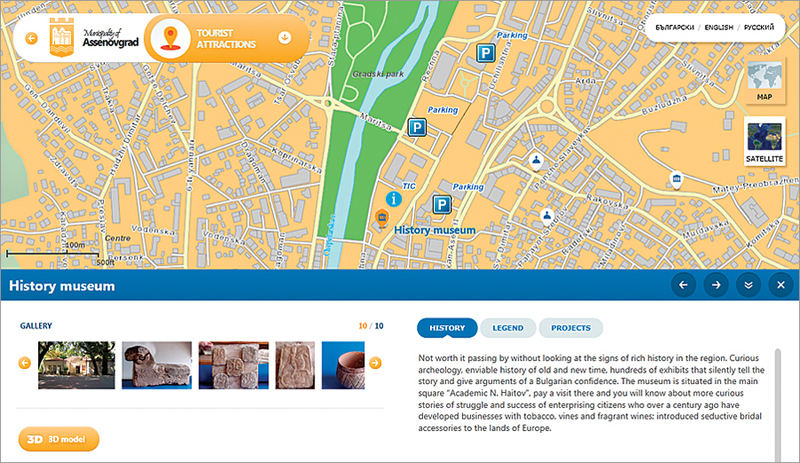 The public web GIS app for the tourist attractions features virtual tours and 3D models. The history museum is a top destination in Asenovgrad, as it reveals curious archaeology and hundreds of exhibits that tell the story of the region. 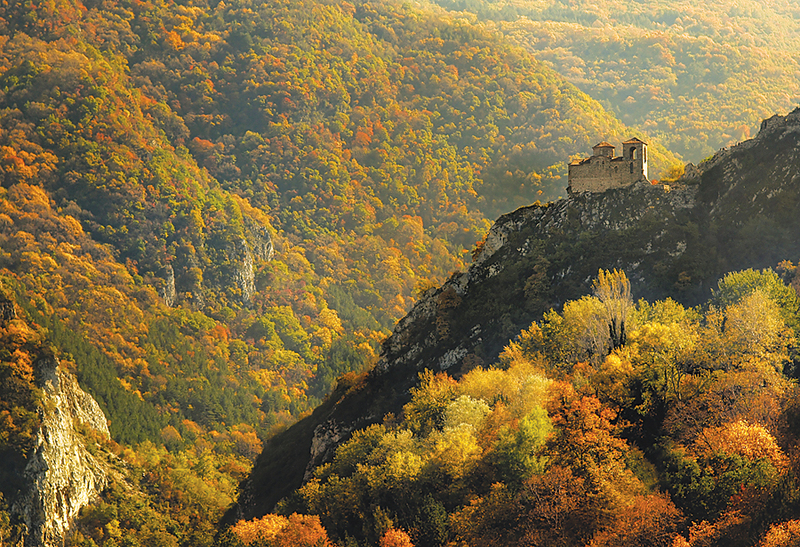 Located in the heart of the Balkan Peninsula, Bulgaria has a long, rich, and fascinating history. Present-day Bulgaria was a cradle of some of the most ancient civilizations in Europe. Known as the “holy gate to the Rhodope mountains,” Asenovgrad is located in the South Central region of the country and is a natural link between Central Bulgaria, the Rhodope Mountains, and the Aegean Sea. Its favorable geographic location and the unique combination of mountain and plain are the reasons Asenovgrad has been inhabited since ancient times. On its territory can be found some of the most ancient and notable cultural, historical, and natural sites in the country. One of the biggest concentrations of holy sites is located there—four monasteries, 33 churches, 60 chapels, and many sanctuaries. All this makes tourism the priority sector for Asenovgrad. Furthermore, the municipal government sets the goal of transforming the tourist attractions into a business card of the town. The transformation of Asenovgrad into an attractive and popular tourist destination is not an easy task, and the administration faces many challenges. One of the main problems is the fact that many of the natural, historical, and cultural heritage sites are almost unknown. There is also a varied spatial concentration of tourism, as some of the tourist attractions are visited often and others remain neglected by tourists, and this causes severe fluctuations in attendance—a direct consequence of the undeveloped geographic structure of the tourism in the region. Information about the attractions is maintained in many different registries in various departments in the municipal government or is even missing. This leads to ineffective and poor tourism management. To solve these problems—as part of the project Asenovgrad-Holy Gate of the Rhodope Mountains, funded under the European Operational Programme Regional Development—Asenovgrad began a project to develop a GIS for the tourist attractions. Esri Bulgaria Ltd. was selected to develop and implement the systems. The public geoportal offers a 360-degree virtual tour of the Assen's fortress. To achieve the project objectives, Esri Bulgaria’s team analyzed the available information for the tourist attractions, including the information requested and provided by the municipal government, as well as information available from other sources. The team also analyzed the information interaction between the municipal government, the public, business and third parties, and the need for improvement in this area. Based on this analysis, Esri Bulgaria designed GIS for Tourist Attractions based on ArcGIS technology that provides collection, integration, storage, editing, and analysis of all the spatial and descriptive information for the tourist attractions in Asenovgrad. This GIS optimizes the processes of tourism management and ensures effective interaction between the municipal government and third parties. As part of the GIS, a special web GIS application was designed to promote the tourist sites in a new and more attractive way. GIS for Tourist Attractions was built to be centralized. It creates and maintains a single centralized database and provides all users with online access to its features and capabilities, depending on their permissions. Desktop users can access the system capabilities through the LAN network in the municipality, and web users, through an Internet browser. The GIS consists of two subsystems and a module for system administration. The subsystem Tourist Attractions is developed as a web application designed for use by all the municipal employees. The subsystem allows the employees to enter and edit spatial and attributive data, make analyses, and prepare different reports. The subsystem Data Publishing allows the employees to publish information for the tourist attractions on the Internet. A notable feature of the Assen's fortress region is the Church of the Holy Mother of God from the 12th–13th century. A special public geoportal provides access to rich information about the cultural, historical, and natural attractions in the municipality. The geoportal also allows visitors to learn their locations and how to reach them and to discover related projects. In addition to the gallery of video and photography, there are also 3D models of all the tourist attractions. As part of the project, a 360-degree virtual tour of the Assen’s fortress—one of the most fascinating and notable attractions in Asenovgrad—was developed and integrated into the geoportal. 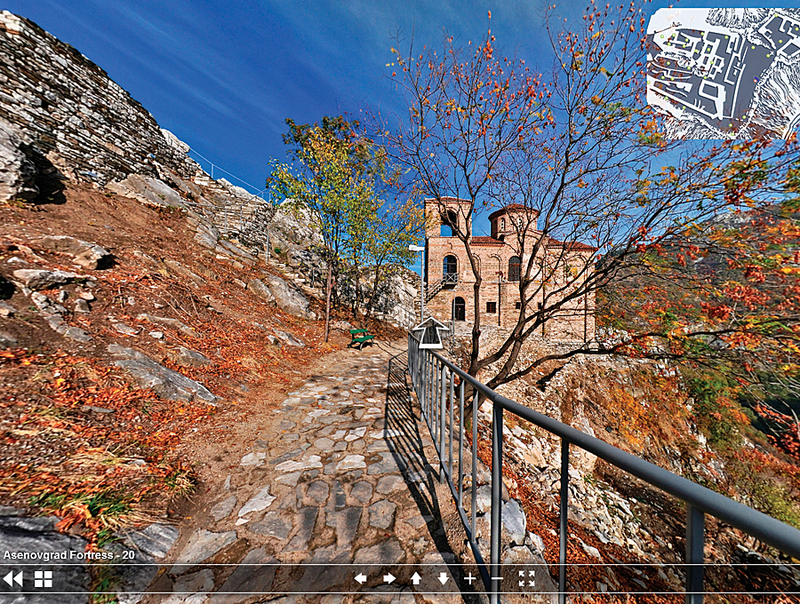 For this purpose, special virtual tour images were captured and then processed and retouched. The virtual tour of the Assen’s fortress enables people to see and explore the attraction. The tour allows the user, by clicking the mouse, to pan up, down, and all around a view and thus gain a sense of realistic sightseeing. For more information, contact Velichko Atanasov Pramatarov, project coordinator, Planning Programs and Project Management, Asenovgrad Municipality, or Katerina Kuzmanova, marketing expert, Esri Bulgaria Ltd.